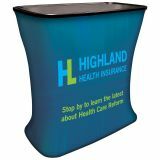 Qwik-Travel Tables from Tuff Flags make popular options as school morale boosters, tradeshow banners,signage for events and more. 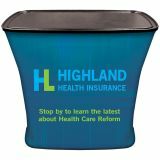 These portable tradeshow travel tables are easy to transport and use as it comes with banner, trunk and table all in one. It is perfect for a single representative travelling to shows and can be used as a show table and to conceal additional show materials to make the area more presentable. 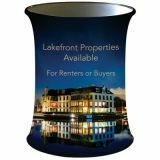 These can be digitally imprinted in full color and in unlimited color choices to make a highly visible billboard for your brand.Shop from our complete line of Qwik-Travel Tables right away and avail the best prices, quick shipping and much more! 100% customer satisfaction guaranteed! 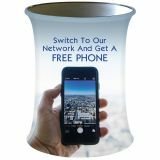 Our Qwik-Travel Tables make handy display tables for events and tradeshows. These grab on the go display items that have a collapsible design are easy to pack and set up in a few seconds. It has a durable black plastic case with handle and integrated wheels and sturdy Aluminum Legs. Choose from various models like Auto-Rise Table Stand and raisable table stands that can be set up in 3 seconds. We also have replacement banners for these tables. The table along with the fabric has a modern stream-line look that gives a clean, fresh, and inviting look to the tradeshow spaces and enhances your professional identity. If you have been looking for a travel table that will keep all the swag well concealed, enhances the milieu of the space and is easy to set up, look no further than these Qwik-Travel Tables from Tuff Flags. Browse our impressive collection and choose a model that matches your need. Should you need any suggestions or tips, call us at our toll free number (888) 872-3524 or email us at customercare@tuffflags.com and can assist you.